I was so nervous to paint my kitchen cabinets. I hated the drab wood, but the thought of taking them all apart to paint them just didn't sound fun to me. Not. At. All. Last week my mom came and without hesitation we dove right into the project. We started it one evening thinking it would just take a day or two. Ha. Nope ! It took almost a week, but I couldn't be happier with the final result! We started off this kitchen party by removing all of the handles and hinges. Please do as I say and not as we did and put those 50 screws in a safe place so you don't lose them. I promise you will like having them all at the end to put the chaos back together again. Next, we wiped the cabinets down with liquid sandpaper. It comes in many forms but any sort of deglosser that strips the wood of it's oils to prepare the surface for the paint will do! Just make sure you have some form of ventilation or you may see things that aren't really there! Next, we laid the cabinet doors all across my kitchen and slapped on some wood primer. It's tricky to get in all the grooves and catch those drips before they dry so make sure you take a double check around after you are finished. This type of project is a wee bit trickier with a 9 month old. We had to strategically do the painting while she was eating or sleeping! Here's a peek at our set up! After the primer on both sides had dried overnight, we started putting the paint on. I used straight up white from Sherwin Williams in the ProClassic Satin Finish and I love how they turned out against my gray walls! We used a sponge roller for the centers of the cabinets, a brush to go around the edges and trim and did 2 coats on both sides just to make sure we got good coverage! Needless to say, my kitchen was an absolute wreck while this project was underway. There were drawers and cabinet doors propped up all over the kitchen and dining room. Once both sides were nice and dry, I went to work putting everything back together! It was so worth the few days of craziness to have a beautiful and bright kitchen! It made such a difference and I'm so glad that my mom was here to help make it happen! Looks great! I love white cabinets. What a rewarding project! So glad that you were able to use the same hardware! Love the white! it gives it all a great fresh new look! Ha ha, totally understand about the 9 month old.... I can't never seem to get anything done anymore with my little one crawling around :) so worth it though! I have some cabinets at my rental house that I'm totally ready to make over! You did an amazing job painting those cabinets! I love it! Looks clean. Good job! I've always wanted to paint my kitchen cabinets in Halifax white, but I've never had enough courage to! I'm always afraid I'll mess it up. Yours turned out so beautiful, I think I'll give it a try! Thanks for inspiring me! That is awesome! I will have to show this to my Wife. 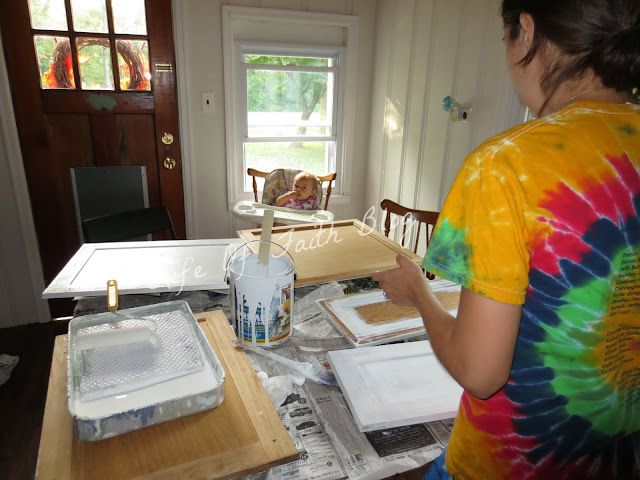 She has been wanting to paint our kitchen cabinets in our home here in Halifax. I think that we could make them look awesome!